Disco Under the Stars at the Tamisa Golf Hotel | Marbella Marbella – Adelante! Following the success of the Nile Rodgers “Chic” Disco party under the stars, we were asked by many people to put on a party featuring the DISCO music of the 70s and 80s…..and THIS IS IT!! Limited to 150 guests, this Disco Party will be a very special night to remember in the grounds of this exclusive luxury venue. There is also a “Retro” snack menu for those wanting to eat on the night. This is a FREE but private event and only accessible to guests who receive official invitations. The venue is the luxury Tamisa Golf Hotel, Mijas Costa, on Saturday 8th Sept from 9.00pm. 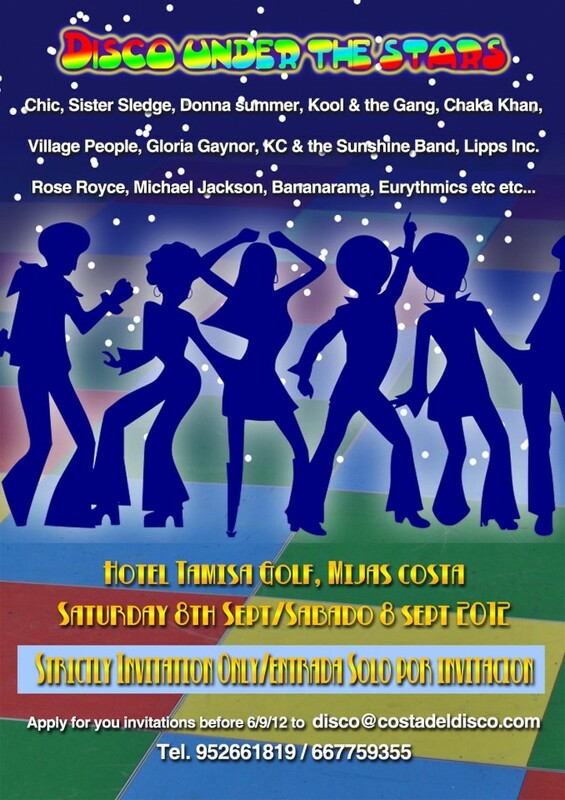 This is an invitation only event so please send me an email to disco@costadeldisco.com with the full names of each member of your group. You will receive a personalized invitation that each person must bring printed out on the evening. Limited numbers so make sure your group is on the list! All invitations will be put into a grand draw for some wonderful prizes including “Bed and Breakfast at the Tamisa hotel with Cava on arrival” worth over 100 euros, Disco CDs and more! VIP seating areas now available for a minimum of 5 people @ 10 euros per person. Comfy sofas and seats, a bottle of cava (per 5 people) and canapés.